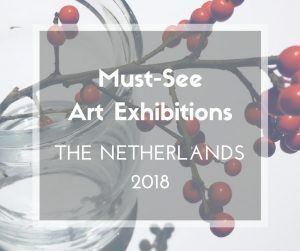 It’s the first Monday of the month again and thus time for the ArtSmart Roundtable, a monthly series of articles by a group of art focused travel bloggers. 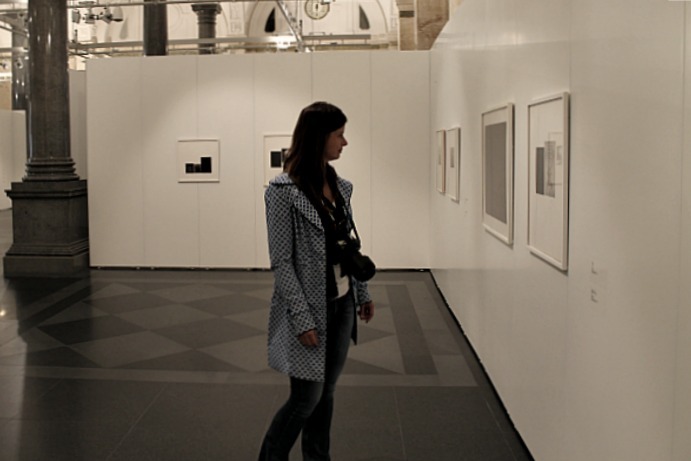 This month the theme is ‘light’ and we found the inspiration from our recent trip to Riga and the Vija Celmins exhibition we saw there, part of the ‘Riga 2014’ program of the city’s European Capital of Culture year. Have a look at the two ocean pictures below, study them for a while and try to think of the differences your eyes can capture. In what ways are the two images dissimilar? At first glance they both look like photographs of a calm sea, scenes where the water is the main actor and where light plays that important supporting role. Or maybe even the other way around. There’s one hitch, however: while one of the pictures is a photo as expected, the other picture is not what you think it is. 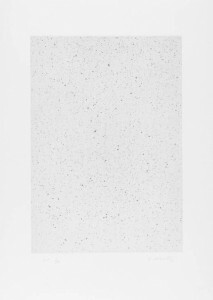 The second of the two pictures is in fact one of Vija Celmins‘s screen prints, entitled ‘Ocean Surface Wood Engraving 2000‘. It’s not a photo, rather a work of art that requires patience, caressing and something we’re not so used to these days: the ability to slow down. 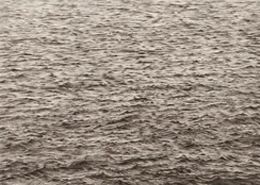 While Celmins’s ‘Ocean‘ might not be that eye-catching at first glance – no vivid colours, no dramatic scenes – it comes into a completely different light once the story behind it is better understood. In fact, the same happened to us now in Riga when we visited the Riga Bourse to see ‘Double Reality‘, this for all Latvians long-awaited Vija Celmins exhibition in her city of birth. Going to the exhibition without too much background knowledge, the first look around the beautiful art space the Riga Bourse offers left some submerged impressions; it somehow felt that there’s more to the works than what we could see. The answers came later when we made ourselves comfortable to watch the documentary accompanying the exhibition, specifically made for ‘Riga 2014‘: “Territory. 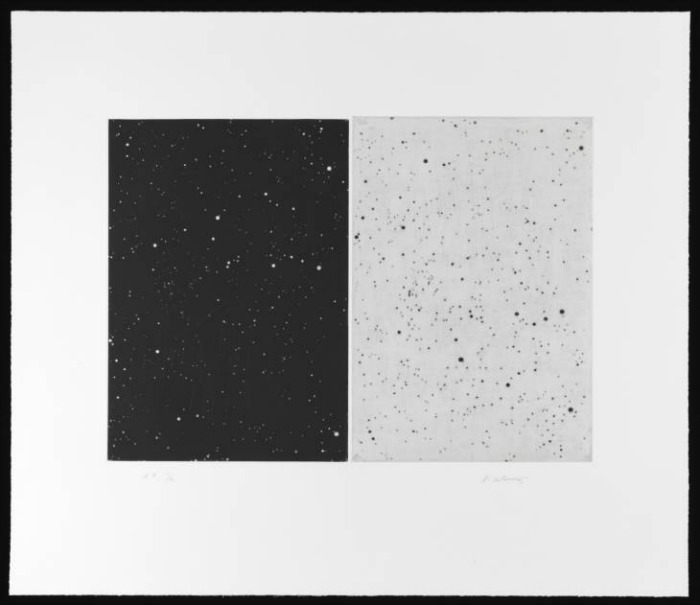 Vija Celmins“. 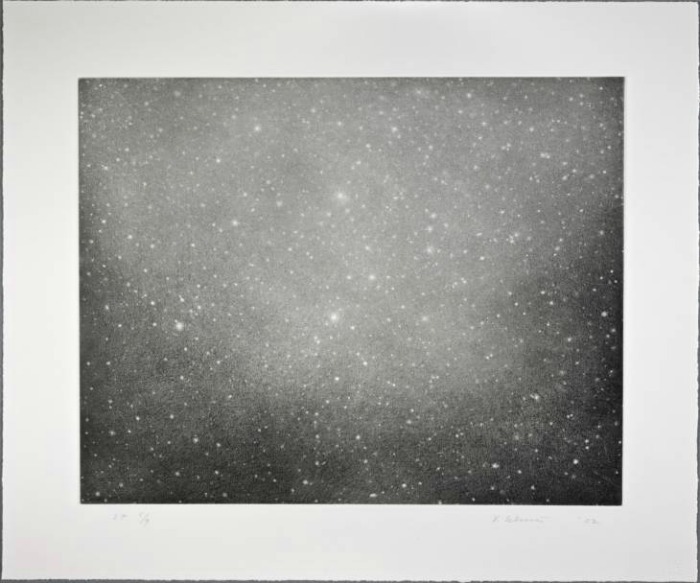 Vija Celmins’s importance in the visual art world is maybe not fully understood by the general public, not many know that she is considered one of the most important artists of our time. The Latvian-American painter, sculptor and graphic artist has even been mentioned in the same sentence as artists that will be the ones remembered from our days 300 years from now. If that happens, it certainly won’t be because Vija Celmins herself has high wishes to stay in the limelight. Already at a young age, Vija Celmins’s life turned into an existence on the run. Born in Riga in 1938, with the outbreak of the war the whole family ended up as war fugitives from the Soviet-occupied Latvia, already in 1940, to eventually leave the country in 1944 for good. After several years in different locations of the eastern region of the war-struck Germany, the family eventually ended up in the United States, where after a brief introduction to American life in New York City the family finally settled in Indianapolis in 1948. Already at a young age she found her refuge in the world of drawings and it was hardly a surprise to anyone that she ended up in art school, as per her own statement, the place where she for the first time didn’t feel like an outsider. In reality, she never really became an insider or even part of the movements of those days; her sense of belonging in her own world remained. Vija Celmins always chose her own path in life. 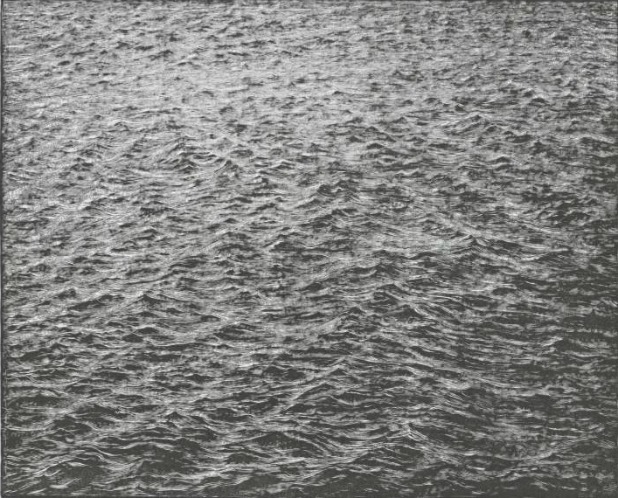 In the sixties when artists “sold out” – as Celmins herself said – and painted soup cans, cartoons and celebrities (you know, there was a certain pop-art movement happening then, where the son of some Polish immigrants kept ending up in focus), Vija Celmins, although active in the movement, went again her own way. The pop-art objects of her choice came far from the glamour of the day: lamps, stoves, pencils. Early on her style had a real preference for the details, the precision; no coincidence thus that her preference for painting monochrome reproductions of photographs caught on early on. From the 1960’s until 1980 the artist lived in Venice Beach, California, where along her art she worked as an art instructor at several of the Los Angeles universities. 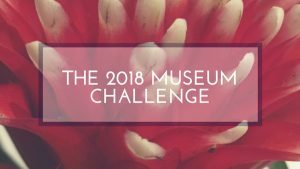 But when she felt she wanted to be closer to the art community in New York, more aligned with her way of looking at art, she moved over to the East Coast. 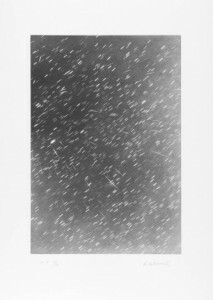 While her early productions were also greatly appreciated it’s in the ’80’s that the Celmins name started to be a ‘label’ to reckon with. During these years she developed her signature style further that made her famous worldwide, a style that can be characterised as a balancing act between the abstract and photorealism. It comes back to the same theme: the oceans, the deserts, spider webs, and maybe most fascinatingly her work on stars and galaxies. The conceptual ideas she used from these days on remain the works most admired by her followers. People want to see themselves in my works, whereas I keep them out. You don’t know anything about space! This is an abstraction. We have never seen space and, if we didn’t have photographs, we wouldn’t even know that it exists. It could easily be said that Vija Celmins’s work is harder to appreciate without understanding it. Some call it even philosophical art and she definitely comes across as the thinking artist. Once you realise the painstaking labour and time put into each work – some of them take several years to finish – it’s hard not to admire what she creates. The level of effort she puts in the details is astonishing – once you see it, the works’ presence magnifies. Looking at her work, it almost feels like she’s building her paintings or engravings layer by layer. By adding different shades, worked out into the smallest detail, she builds life into her creations by imitating the effects of light. All of it is usually created with her pencil and her patience alone. The element of light is never more apparent in her work than her series on stars and galaxies, where unbelievably and painstakingly she works on the tiny details until the work comes to life and brightens up, the stars start shining. Vija Celmins’s imagery almost creates a sense of confusion, a question that lingers around: what is illusion and what is real? Nowhere else is this more obvious than the reverse galaxies she paints, where what’s supposed to be the dark sky turns bright and the stars turn black and still feel real. It’s an invented image, not just a photograph. There’s no reality, it depends on how powerful the telescope is. But the interest isn’t reality, it’s the perfect image of it. While watching the documentary and reading interviews with her it’s hard not to feel pulled into her world of details, an occasion to slow down. In the mid-nineties, around the time of her 30 year retrospective at London’s Institute of Contemporary Art, a newspaper called her American art’s best-kept secret. It feels like that’s exactly how she wants it to stay. 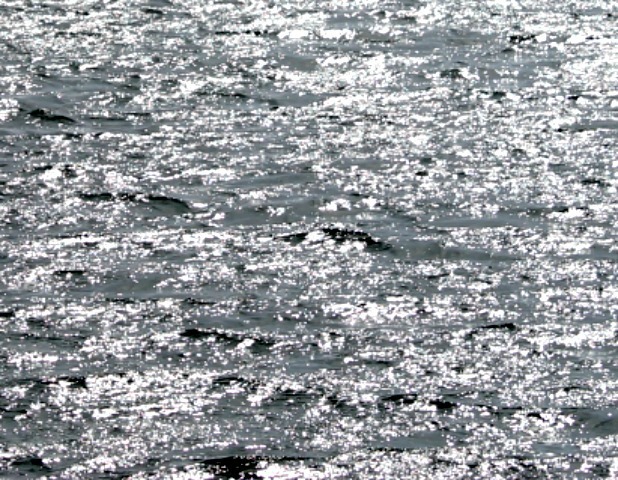 Where Can You See Vija Celmins’s Art? Vija Celmina’s art these days can be found in all of the major museums around the world. The Latvian-born artist has become one of the main representatives of American art worldwide. One of the most high-profile places to see the art of Vija Celmins is in New York’s Museum of Modern Art. MoMa received a gift from a retired real estate agent, valued for a total of $50 million, which included three paintings, three sculptures, eight drawings and four prints by the artist. She can also be found in all of the major American art museums, such as ‘The Whitney‘ and ‘The MET‘ in New York, Chicago’s Art Institute, the Los Angeles County Museum of Art, Baltimore Museum of Art, the San Francisco Museum of Modern Art and the National Gallery of Art, Washington, D.C.
Outside of the US the best places to find her art are the Tate Gallery in London, the Centre Pompidou in Paris and Kunstmuseum Winterthur in Switzerland. During her career Ms. Celmins had some 40 solo exhibitions around the world and countless group exhibitions. ‘Vija Celmins: Double Reality‘ is currently on in Riga as one of the main art events during the European Capital of Culture Year. If you prefer a setting that might be even more appropriate for reflecting over her works made for solitary pondering in search of inner harmony, her collection from the Tate is currently exhibited by the Taigh Chearsabhagh Museum & Arts Centre on the Scottish island of Uilst, far away in the The Outer Hebrides. That exhibition is on until June 28th. The ArtSmart group can also be found on Facebook. One half of the team behind Art Weekenders, where we travel, produce and keep developing our concept. For a living I work with management accounting, for dreaming I delve into many other areas of travel, writing and entrepreneurship, which more often than not don't result in money. Yet... I gained life experiences from living in eight different countries. Combined with extensive travelling in some fifty more, it's fair to say that I'm a global citizen with an international perspective - with the corresponding curse of becoming fairly rootless. My happy base now is Amsterdam - a faith I'm totally comfortable with.